It’s back! Last year’s Dine to Donate event at Recovery Sports Grill was a lot of fun and generated some needed funds for our school. We’re happy to announce that, once again, we have teamed up with Recovery in Verona for another Dine to Donate night! 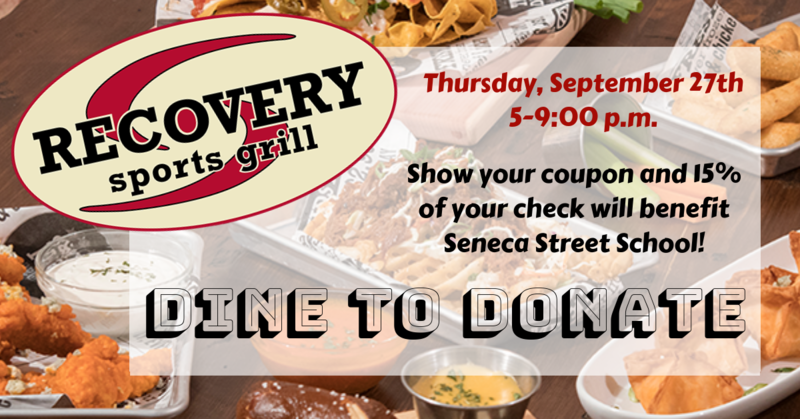 Eat at Recovery on Thursday, September 27th, between 5 and 9 p.m. and 15 percent of your check will come right back to the Seneca Street PTO. To ensure that we get the donation, you just need to present a coupon to your server. Printed coupons will come home with students soon, or you can also print your own from this link. Recovery serves up a variety of great choices including delicious appetizers, burgers, and lighter fare. Kids meals are just $2.99, making it an affordable family night out. Anyone who has the coupon can help us fundraise, so please share with local family and friends. We hope to see you there!